My first post of 2008 has absolutely nothing to do with Earth science. Although I didn’t get to watch it (we don’t have cable), I listened to the NHL Winter Classic earlier today via NHLradio.com. Playing hockey on New Year’s Day is a tradition in many parts of the northern United States and Canada. 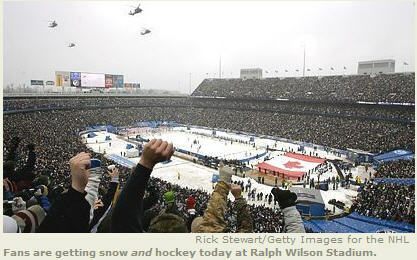 This year, the NHL did something great that I hope they do again — an outdoor game. The game was in my hometown of Buffalo, New York, which is rabid for hockey (and only 15 minutes from the Canadian border). The Buffalo Sabres played the Pittsburgh Penguins in the outdoor stadium that is usually used for football. Apparently, there was talk about whether or not they could fill the stadium. They sold out easily — 70,000 fans showed up and got a real treat … it was plenty cold and it even snowed during the game. This is how hockey should be. I wish I had been there. A bunch of idiotic media types poo-pooed the idea, whether or not it was a good move for the NHL, if the event would increase popularity for the sport in the States, blah blah. Who the hell cares? It’s a hockey game. The rest of the country can watch football, that’s fine with me. Check out some photographs I found from this great event (click on the image to go to source). Workers mist the ice surface in preparation for the game. Sabres practice on the outdoor rink on Monday. Unfortunately, Sidney Crosby for the Penguins (above) scored in the shootout to beat my Sabres. CD – We need more outdoor games. It was a fun game to watch and the players even had an extra something in their play. Despite the size of the crowd, the outdoor game is more intimate and is much more personal to me. I have the benefit of an outdoor rink just 2 minutes walk away where I live in Ottawa. The rink is continuously full of kids of all ages (even us “older kids”). I agree…more outdoor games would be cool. I don’t live in a place that has a vibrant hockey ‘culture’ right now, unfortunately. Growing up in western New York State, my dad (or friends’ dads) would make a “rink” in our backyard…we would stamp all the snow down as flat and even as we could and he would spray it with water. It was pretty fun…even though I’m a horrible skater. That is awesome! I’m jealous by about 40 degrees C.